Is there a big difference between a show here and one in Latin America? There is no difference because the love for dogs is the same all over the world. I mean, with regard to the show, as you will have the organisation of the World Dog Show in 2017? I think that the number of dogs in a dog show is important, but not the most important, because the organisation depends on each country, each continent and even each dog show, the most important is the participation of the breeders, the owners and the dog show enthusiasts to make it into a nice dog show. In the past, it was not always the easiest thing to bring over dogs to another continent. Argentina was good, in Brazil there were problems. Do you have things in mind that you think you will take care of in order to prevent problems? The world is nowadays much smaller, because communication problems have been solved now. We can use social networks, mails, websites. We plan to make use of this in order to promote us, not only as breeders, but in a much more familiar way, more like brothers in this dog world. Please give me a few examples of what, in your opinion, is very important. We must, to quote our new FCI President Mr Rafael de Santiago, for the coming 100 years think and do what we can do to create a possible north for each of the five continents and make it into one world and one dog show and no longer see it as separate continents. And more specifically, with regard to the show? Via the social media, like Facebook, Twitter and internet, we are able to see what happens in the different countries, we can see the results right after the show. We will use these information tools as much as possible. 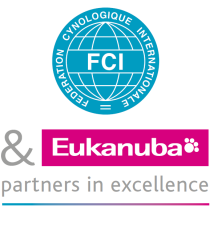 FCI’s policy considers all the countries of the world; World dog shows will soon be organised in Helsinki, Milano and Moskow. We can learn from them, also thanks and with the help of the social media. Thank you Mr Delos Márquez Mantilla!